Last September, Walsh published details of a gene he had discovered, called NDM 1, which passes easily between types of bacteria called enterobacteriaceae such as E. coli and Klebsiella pneumoniae and makes them resistant to almost all of the powerful, last-line group of antibiotics called carbapenems. Yesterday’s paper revealed that NDM 1 is widespread in India and has arrived here as a result of global travel and medical tourism for, among other things, transplants, pregnancy care and cosmetic surgery. And this is the optimistic view – based on the assumption that drug companies can and will get moving on discovering new antibiotics to throw at the bacterial enemy. It’s not just infectious diseases that will become a big problem again, either; without effective antibiotics, you can effectively rule out organ transplantation, and a whole raft of other stuff. Will that ten-year window be wide enough for us to develop some sort of blood-cleaning nanotech? Geek sickness: can social rejection make you ill? In the study, a group of researchers recruited a bunch of students at UCLA and subjected them to socially stressful situations. The students were asked write a speech and then read it to a pair of evaluators, who then acted as if the speech were abhorrently subpar. After that, they had to perform mental arithmetic for a proctor who would appear impatient with them and urge them to go faster. A subset of the participants were also made to play a game of “Cyberball” with two other people, who were asked to socially exclude them. Throughout these socially stressful experiences, researchers took mouth swabs of the students and monitored their activity in the dorsal anterior cingulate cortex, a part of the brain known to process rejection-related distress. (It’s possible that the swabbing added to the stress.) The two measures showed that greater activity in this area of the brain correlated with a rise in two inflammatory chemicals that are known to play a role in the onset or progress of conditions like rheumatoid arthritis, cardiovascular disease, depression, and various types of cancer. Correlation is not causation, of course… or, as Ars more bluntly puts it, it’s unclear whether “being a nerd begets asthma, or if asthma begets a nerd”. 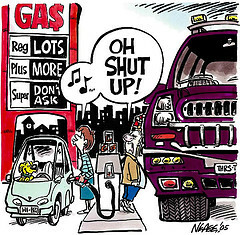 Of vapor and violence: Do gasoline fumes fuel aggression? Here’s the agenda for this item: I distinctly remember that when I was a kid, sometimes–not always–the smell of gasoline would get me what one would today call high. It’s been a long time since it had that effect on me, but I also remember looking forward to those visits to the gas station. A new study, published in the open access journal BMC Physiology, has shown that rats exposed to fumes from leaded and unleaded gasoline become more aggressive. Amal Kinawy, from Cairo University, Egypt, examined the emotionally incendiary properties of gasoline in three groups of male rats, each exposed to either leaded-gas fumes, unleaded-gas fumes or clean air. As well as observing the animals’ behavior, she studied any resulting neurological and physiological changes. She said, “Millions of people every day are exposed to gasoline fumes while refuelling their cars. Exposure can also come from exhaust fumes and, particularly in the developing world, deliberate gasoline sniffing as a means of getting high”. The research demonstrates that rats exposed to either kind of fuel vapor showed increased aggressive behavior, such as more time spent in belligerent postures and increased numbers of actual attacks, in comparison to the clean air group. Can’t recall either of my parents remarking on any strange behavior on my part. Not because of that, anyway. The ever-traditional more research is needed to rush to assumptions about gasoline vapor’s effect on humans, but it’s one more thing to worry about.